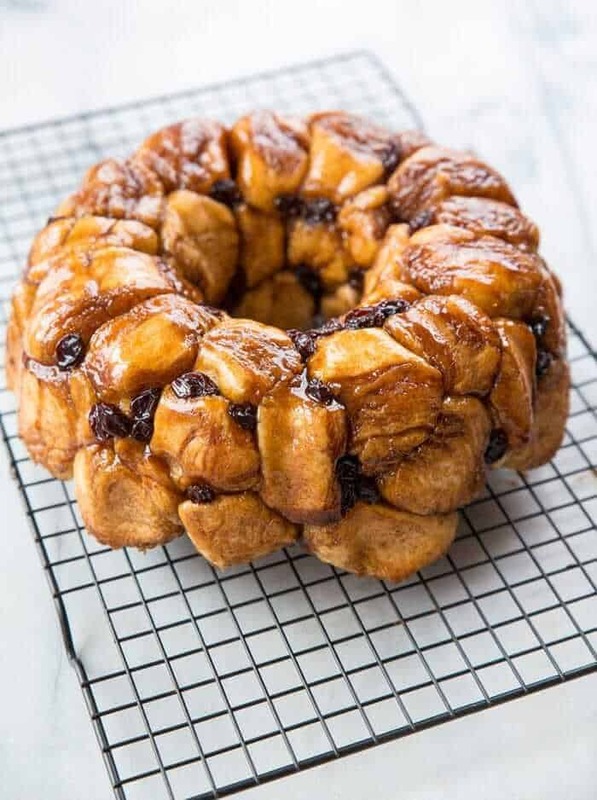 This Homemade Monkey Bread Recipe is so good and so easy that it made it into my cookbook! Throw away the cans of dough you guys and make this from scratch! My 14 year old son just made the actual monkey bread that you see in the updated photos, so if he can do it, so can you! This is a great recipe for those bakers that are just beginning to bake with yeast breads and anyone that is wanting a sweet, carb-loaded treat! Listen, I LOVE a good canned dough recipe. I have no problem using them in camping foods or in a pinch. 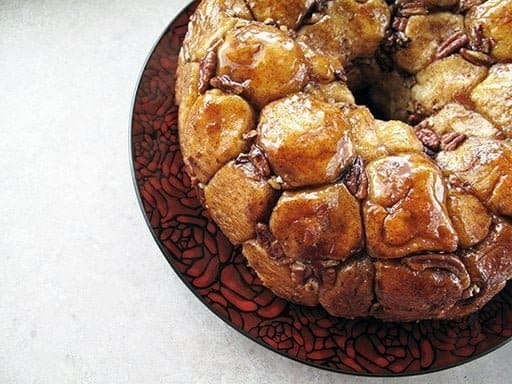 But this Monkey bread is so easy that just seems wrong to use a canned dough. 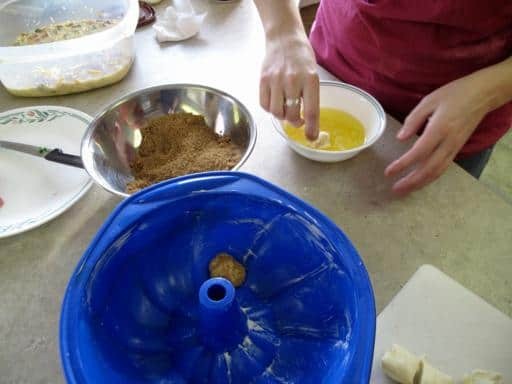 If I am going to indulge in something this amazingly bad for me, I want it to be homemade and the best it can be.You need a lovely homemade sweet dough to start and please do not let that scare you away. This is SO easy, I promise that it only takes one run through of the recipe and the second time you are a pro! I am going to go step by step through this recipe for you guys, with some photos to show you what’s going on as well! Like I said, my son made this and while you would think he’s a super baker and cook because I’m his Mama, he’s still learning! Onward, bakers! If you would like to use a stand mixer, mix flour and salt into the mixer bowl that is fitted with a oiled dough hook. Oiling the hook makes sure the dough doesn’t climb the hook and go all crazy on you. Works like a charm! Using the lowest setting, start the dough hook going and slowly add the milk mixture. After dough comes together, increase speed to medium and let your dough hook do the work until the dough is shiny and smooth, about 5-6 minutes. The dough should be slightly sticky but if it is too wet to come together into a ball, add an additional 2 tablespoons flour. It should just barely stick to your hands, nothing more. Turn dough onto lightly floured counter and knead briefly to form a smooth, round ball. If you are ready for a workout and want to do this by hand or don’t own a stand mixer, mix the flour and salt in large bowl. Make a well in the flour, then add the milk mixture, pouring into the well. Using a wooden spoon, stir until the dough is difficult to stir and it’s almost a ball in the middle of the bowl. 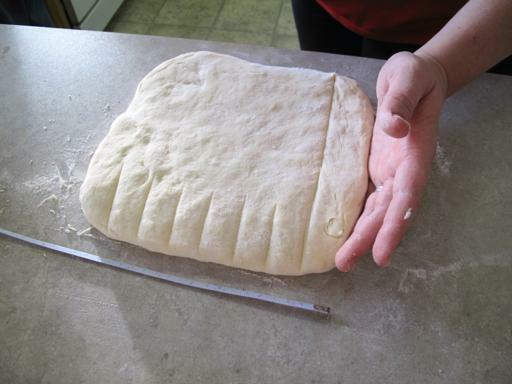 Turn out onto lightly floured work surface and begin to knead, incorporating any loose scraps back into the dough. Knead until dough is smooth and satiny, about 10 minutes, giving those arms a workout and a half! Shape into a round ball. 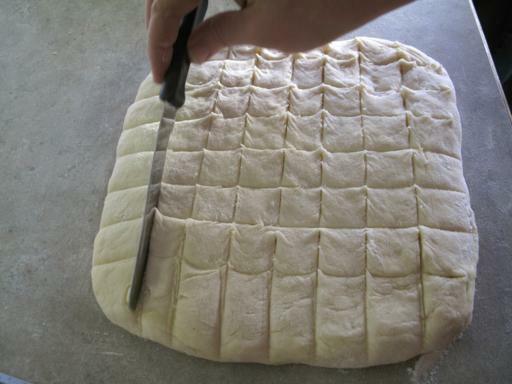 Take out the dough and on a lightly floured work surface roll it into a 8 inch by 8 inch square. Yes, I measured. With a measuring tape. Once you have that 8×8 square, mark off 8 sections, each way, so you are ending up with 64 lovely little squares. See? It’s easier than it looks! I know that I sound crazy that I cut the dough into 64 pieces, but it works! Cut the squares apart,making sure to separate them as you cut, they love to stick back together which defeats the purpose entirely. I usually just scoot them to the side of the cutting board so that they are out of the way. Melt the 1/2 cup of butter in a bowl. In a larger bowl combine the brown sugar and 2 1/2 tsp of cinnamon. Roll a dough square into a ball, dip it in the butter, dip it in the sugar mix then place it in the bundt pan. Stagger the layers until it looks like this. Build like you would build a brick wall, staggering the “bricks” so that the seams are not in the same place ever, building a lovely wall of dough. Sprinkle a few raisins and pecans between each of the layers, however you want. Ok, not quite like this, this is AFTER it rose, but you get the point. To get to this literal point now, you have to once again place the dough somewhere warm, the oven works perfectly.In about 45-50 minutes the dough will rise almost to the top of the pan. Time to bake! After you remove the pan from the oven preheat it to 350 then get those babies back in there to bake. This took about 22-25 minutes in my oven. The bread will look slightly dark – watch out, you can overcook this!- and crisp on the outside. Flip onto a beautiful plate and serve to very grateful recipients! You can frost this with plain icing, cream cheese icing or anything you want, however serving it without makes it less cinnamon bun- like. It’s like one, big, amazing pile of homemade doughnut holes this way, NOT a cinnamon bun. We don’t ice it in the slightest, if I wanted cinnamon buns I would just make them. I said 64 squares, but the monkey bread pictured had 54 or so. 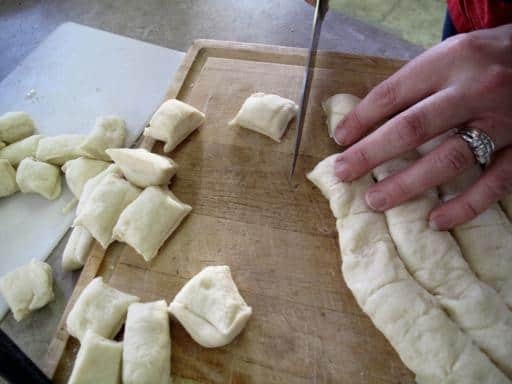 It’s really a flexible recipe, what you are aiming for is pieces that aren’t too thick and are about an inch wide and roll into an inch wide ball of dough. That size bakes up nicely! 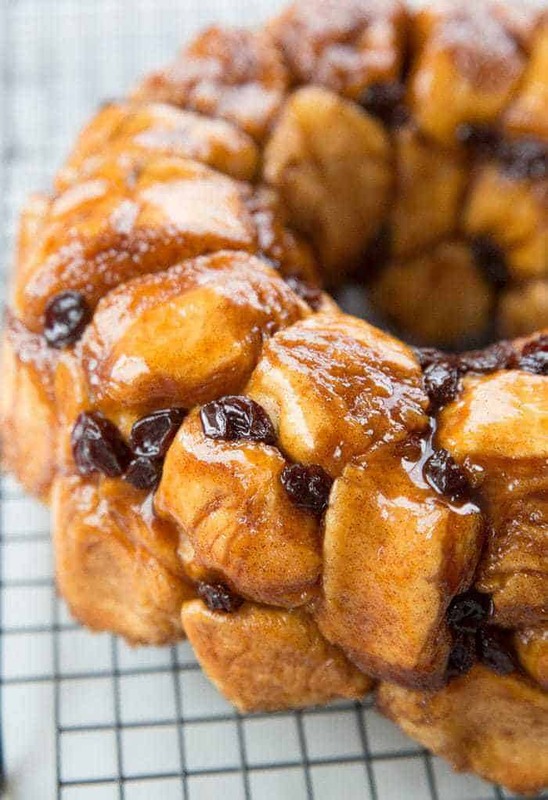 You can add pecans, walnuts, anything that your heart desires into your monkey bread. We love raisins the best, so this one pictured is plain raisins. If you are looking for an icing recipe, try my Buttery Vanilla Glaze, it works perfectly! This is a new family favorite, perfect for Sundays at home with the kids, I can’t wait to make it again! 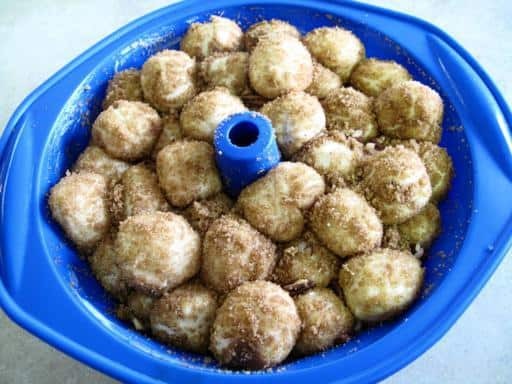 Monkey Bread made with a homemade sweet dough, easy, delicious and wonderful for weekend brunches. If you would like to use a stand mixer, mix flour and salt into the mixer bowl that is fitted with an oiled dough hook. Oiling the hook makes sure the dough doesn't climb the hook and go all crazy on you. Works like a charm! Take the ball of dough and place in a well oiled bowl, covering it up. Put it in the oven and let the dough rise until doubled in size, anywhere from 45-60 minutes. Once you have that 8x8 square, mark off 8 sections, each way, so you are ending up with 64 lovely little squares. Roll a dough square into a ball, dip it in the butter, dip it in the sugar mix then place it in the bundt pan. Stagger the layers. Build like you would build a brick wall, staggering the "bricks" so that the seams are not in the same place ever, building a lovely wall of dough. Sprinkle a few raisins and pecans between each of the layers, however you want. Time to bake! After you remove the pan from the oven preheat it to 350 degrees then get those babies back in there to bake. The bread will look slightly dark so watch out, you can overcook this!- and crisp on the outside. This is one of my all time favourites for breakfast! I’ve made this several times, and will do it again soon! Wonderful recipe, thank you! Wade Woodcock did you put this on as a reminder for your mother? RuthMEtienne It’s your yeast for sure. Buy a fresh jar and make sure the water is as warm as I specify. RuthMEtienne Or your house is told cold. Bread will not raise in a cold house. No matter if the yeast is new or not. talia_teeger9 That looks incredible!!! I’m drooling! surprised he popped in to snack! I have made this several times already it`s such a sin!!! It goes in minutes, people can’t stop eating it. I usually don’t have raisins but I do have dried apricots, I plump them in hot water, and my oh my!!! Thank you so much for a wonderful recipe, all the way from Montreal. @Virginia Make sure to check out my Christmas version! It’s SO festive!!! I am so glad that you liked it! I am doing this recipe right now, has anyone done individual ones? I am going to put 3 balls in each cup of a muffin tin. @Bart That sounds AMAZING! I will try to make it when I get home! Has any any one tried making in it is a stack-cooker from Tupperware in the microwave??!!! @Rachael That is a seriously awesome life hack using a rice cooker! Good job!! @Rachael could you tell us what substitutions you made? I have a friend in Japan I would love to introduce this recipe to, but most people in Japan don’t have ovens either. What size pan did you use? I am making this for Christmas and my pan is 27cm so bit worried mines too big for this recipe!! We just finished having a hot cocoa tea party with this, and it’s AMAZING! I didn’t add in the nuts or raisins ( I didn’t have nuts and i don’t like raisins!) 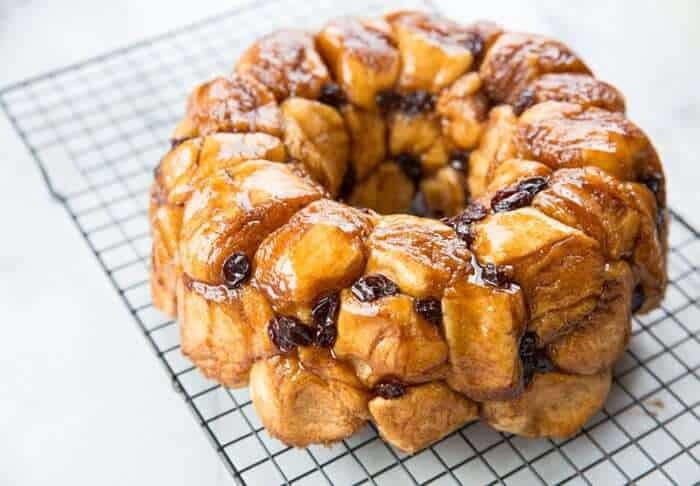 My husband said it was the best monkey bread he had ever had, and I agree! Simply perfect! mldingler So glad that you liked it! Funny enough I made it this past weekend as well. thekitchenmagpie is there any way you can make this in advance? 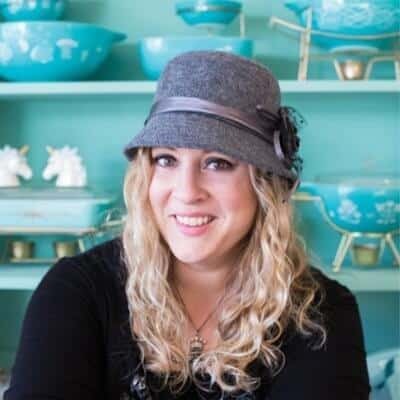 I am hosting an Origami Owl party on Saturday, and I am having a monkey bread bar for the food. I would like not be rushing around last minute, but I really want to make this amazing bread! I’ve been looking for this recipe for awhile, found others but they didn’t quite seem the same or as close to my Mum’s. As a child, we had this on the table Christmas morning to nibble on while we waited for everyone to get up. The only difference ~ Mum would put mixed peel, red & green cherries as well as pecans instead of the raisins! I can hardly wait to have this on my table Christmas morning ~ Thank you! SharonThomas Oh, I just baked that up! I’ll blog it soon! Thanks for the idea? Just made this last night. It was absolute perfection. My family ate the whole thing. Not a piece made it till morning. Thanks for the recipe. The recipe looks great. I just have 1 small correction in your instructions. – as you can see, the 2 1/2 tsp should be cinnamon. This slight error is obviously not a problem since many have made your Monkey cake without any issue. Courtney Willie. For you in case you don’t have a recipe yet. how would you store this for, like the next morning? this is incredible! I have long been making cinnamon rolls and my family loves them. But this is the new request! these are so good and such fun to make together. Oh man…send some my way! I am so glad you like the recipe, and isn’t the oven warming the best? I use it all the time too, everything rises so lovely! Thanks for the kind words Cayla and welcome!! Hi Karlynn! I adore your Monkey Bread recipe! I’ve made it four times since finding it, um, two months ago…I might be a little addicted. 🙂 But I wanted to thank you specifically for the oven-warming tip at the beginning of the recipe; I now use this method any time I need a warm place to store a yeasted dough (monkey bread, regular sandwich bread, pizza dough) for its first rise. Thank you, thank you! What size Bundt pan is used? I think mine is 12 cups; this looks smaller. Thanks. Another great looking recipe I need to try! I was also very, very excited when you said to grease the dough hook so it doesn’t creep up and over the top. I will definitely do this, as it can drive a person quite mad!! I stand there with a rubber spatula and hold it flat against the top of where the hook goes into and try to catch it before it comes up and over! Thanks a million for the tip and your blog is really wonderful! @grammyof4boys thanks for the lovely words! 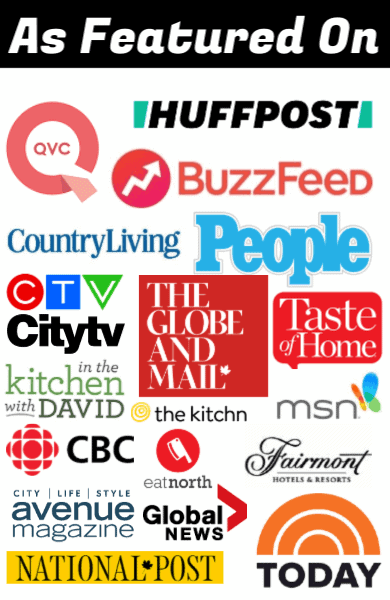 I am so glad you found my little nest on the web 😉 Welcome and hope you enjoy the recipes! Recently, domestic bread machines that automate the process of making bread have become popular. Thank you!! That’s great to hear! I made this for a brunch with some girlfriends yesterday morning – hands down, BEST monkey bread I’ve ever made. My goodness – UNREAL! There was 4 of us. We consumed the entire thing. Thank you!!! Nope, no egg! But you are right, some recipes are an eggy dough. This is something I will be making for Christmas this year. Thank you for this great recipe. We make it for Christmas brunch! It’s one of my favorites, glad you enjoyed it! Oh Priscilla, this is the tastiest bread for a weekend morning ever. It’s our family favorite, for sure. I hope you enjoy it! Yummmmm! In my oven now… So can’t wait. Never tried rolling it in the brown sugar mixture. Can’t wait till it is out of the oven and in my mouth! I am jealous…send some to my work 😉 I could use some on a Saturday night! I would try more butter and make sure you get a good layer of sugar on each one. The raisins sorta stick, sorta don’t, they can be hit or miss. I was thinking of attempting a remake of this that has raisins IN the dough, actually. But for the shine, definitely make sure you coat each little ball very well. This is an awesome find! I made some, bagged it up and handed it around, everyone was commenting on it. However, I’m not sure if I did the last part right (rolling them in butter and brown sugar), because all of my nuts and raisins basically just fall off, and it doesn’t have that amazing yummy sticky shine to it that yours has throughout. Any suggestions? More butter perhaps? monkey bread rules! I cannot wait to try this out. It looks amazing. Thank you so much for sharing. I love the step by step tutorial. I have made Monkey bread before but never ever by starting it from scatch. Looks very easy and delicius. Ohhhh my! Thanks for the great directions – this is definitely a must try!! If you love this then you should try Gorilla Bread. It is to die for! I’m drooling all over my computer desk! This looks sinfully deelicious! I’m printing this out as I write. Thanks so much for posting!! Oh no… I didn’t listen to your warning…and now I’m hooked….I MUST MAKE NOW!!! Look away? No way! It is too beautiful not to stare at. I have been meaning to make monkey bread since before Christmas thanks for the reminder 🙂 I hope it looks (and tastes) as good as yours. Oh my. Look away? After spotting that pic on tastespotting? That’s impossible! I’ve never had monkey bread in my life, but if it tastes just half as good as it look, it must be really really good. I LOVE monkey bread! A friends mom made it years ago and I was amazed. I’ve never tried making it myself, it seems pretty straightforward. Thanks for sharing your recipe! Make it Vicki! I can’t stress how once you do it the first time, you are a PRO the second time around! This is honestly something that I think everyone should have in their back cooking pocket to pull out for weekend brunches. The ingredients are almost always on hand and it’s super easy AND fun to do with the kids. 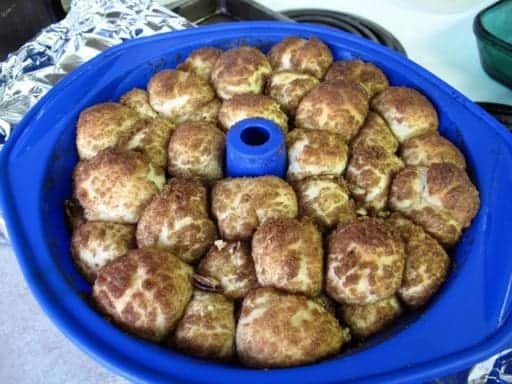 This is the most detailed and most tantalizing tutorial I have ever seen about monkey bread. You are breakin’ my heart. It is the season for bread making, for sure, and I have been doing quite a lot of that lately. Valerie, winter just calls for bread, doesn’t it? The carbs, the heat of it, it’s all good. This has to be my favorite new recipe by far and will remain in rotation!